Yes, I work for Microsoft, but I always like to tell people about great customer service…this time from Apple. I bought an Apple Airport Extreme 5th Gen Router back in May 2012. 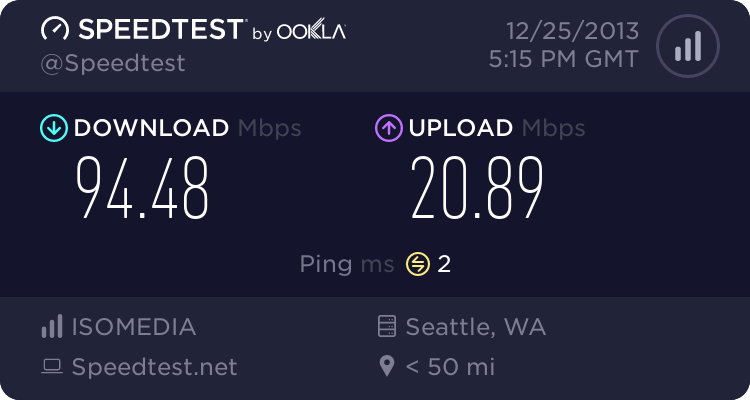 I get very fast (100mbps) internet at my house and the Airport Extreme is the only router that consistently gets around 94mbps over the air. It’s okay to be jealous. It worked great for about a year and then it started disconnecting ever 20 minutes or so. I tried everything from downgrading the firmware to factory reset to hardwiring…nothing helped. I went to BestBuy (where I bought it) and they said there’s nothing they can do because it was out of the 1 year warranty. They couldn’t do a trade-in because it wasn’t functioning properly. They were cool about it, but told me to take it to Apple. So, as a last ditch effort I made a Genius Bar appointment. They also said there’s not much they can do. They offered to sell me a new one for $152 or I could buy the latest model for $199. I was bummed because I just dropped about $200 on it a year ago. Me: "Is there any way I could maybe talk to a manager or someone who can get creative on how to maybe give me a credit for my router in exchange for a new one? I mean, I just dropped $200 and I really did expect it to last longer than a year." Manager: "Hey man, so I totally understand your situation"
Me: "Yeah, it’s an interesting situation because I love this router, it just disconnects all the time. I dropped $200 a little over a year ago and I expected it to last longer. The Genius said he never sees these routers come back, so I’m thinking it might be a defective one. It would awesome if you could pull a few strings for me." Manager: "Sure, I’d be willing to split the difference with you. I want you to leave here feeling like you got what you wanted and I want you to be happy with your experience. How does that sound? How about I cover $100 and you pay the remaining $100 on a new one?" Me: "Absolutely, that would make me extremely happy! Thank you so much"
Manager: "You know what is also cool, is that we just had a decent conversation. Most people come in here and demand a free replacement and get very hostile. I appreciate you being cool about it." Me: "Definitely man, I really appreciate you meeting me half way. "I grabbed my new 6th Gen AirPort Extreme and was on my merry way. Kudos to Apple. The Genius was super cool by not taking offense to me wanting to talk with a manager and the Manager was cool for meeting me half way on the price and treating me very well. Maybe some people would have wanted to get a free replacement – I would have taken it, but I didn’t expect it. It was over the 1 year warranty and I chose not to purchase the Geek Squad warranty and Apple Care. I was at the mercy of the Genius and the Manager, so I gladly accepted the offer. They also let me keep the old router – which is cool, because maybe the issue will go away with a future firmware update. I’m very pleased with my new router and very impressed with how Apple handled the situation. Fitbit Flex vs Jawbone UP24 vs Argus: Battle of the Fitness Bands ... and an app.